By Costa Maragos Posted: March 13, 2018 2:00 p.m.
A course outline, designed to teach financial literacy to Saskatchewan high school students, has vaulted a U of R student team to first place at a tough competition. 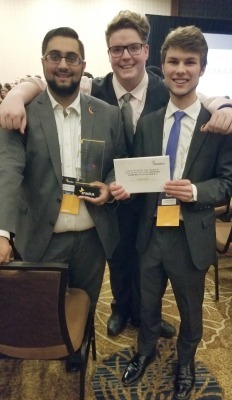 The business student team of Jonathan Lipoth, Salmaan Moolla, and Frank Nordstrom placed first among 23 Western Canadian universities and colleges at the Enactus Regional Exposition 2018 held in Calgary March 1 and 2. The team competed in the Capital One Financial Education Challenge category, finishing ahead of second place Simon Fraser University. It’s the first time a U of R team has placed first in this competition. The team was guided by Dr. Lisa Watson, Associate Professor of Marketing at the Paul J. Hill School of Business and the Kenneth Levene Graduate School of Business at the University of Regina. Members of the winning team (l-r) Salmaan Moolla, Frank Nordstrom and Jonathan Lipoth. “All of our teams gave outstanding performances at this competition,” says Watson. A total of 18 students made up four teams from the U of R. All students are members of Enactus Regina which is a member school of Enactus Canada. Students from all academic backgrounds are welcomed as members. Enactus is short for “entrepreneurial action for us,” an international organization dedicated to supporting students in taking an entrepreneurial approach to making an impact through social and sustainable development practice. The winning team’s project, titled Financial Foundations, impressed the judges for its hands-on way of teaching money matters to students. The project was successfully piloted with 40 students at Regina’s Campbell Collegiate. The class covered money matters including budgeting, taxes, long-term investments, retirement, and savings. The team’s presentation included plans on expanding the class to offer it to more high schools across Saskatchewan. “Placing in this competition verifies that we doing something good in the community and that our project is something that can mean fundamental change for students,” says Moolla, Financial Foundations Project Manager and member of the Enactus Regina team. Personal finance classes are offered at some Saskatchewan schools but they are not mandatory. Moolla says the timing is right to expand financial literacy classes in Saskatchewan. “With rising personal debt levels, it is more important than ever to get students at a young age to begin thinking about how to manage their finances,” says Moolla. 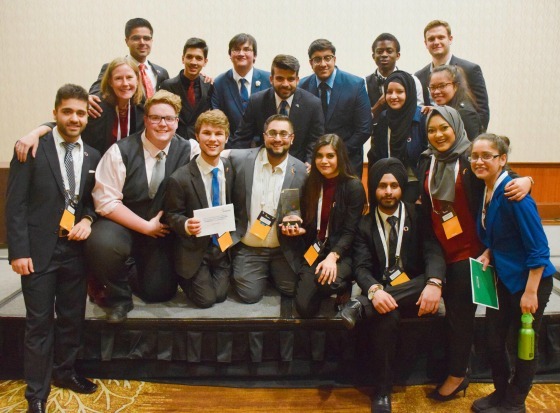 The winning team will now advance to the final rounds of competition to be held at the Enactus Canada National Exposition May 14 – 16 in Toronto. Joining the U of R team from Western Canada include teams from Mount Royal University, University of Calgary and Simon Fraser University.